Imagine the scene – I’m sitting at home in my front room next to my wife, who is watching Grey’s Anatomy (I apologise on her behalf). 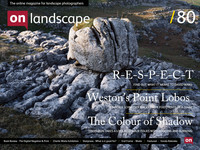 Having recently subscribed to On Landscape I am busy making my way through the substantial number of previous issues and reading with interest so much of the excellent articles that have been submitted. Being fairly new to landscape photography I am hugely enjoying reading the ideas and thoughts of those much more experienced than me as well as viewing their work. But then I come across one particular article, one that begins to elicit a reaction in me that no other article did. I found myself in the strange position of feeling both in agreement with it as well as in opposition to it, understanding the position it set out but also feeling indignant towards that position at the same time. The piece in question was Tripod Wars by David Ward (May 2013) and having stirred such a reaction within me I decided to have a go at putting down some thoughts. Joe Cornish: Really enjoyed your article Tom, both pictures, and written thoughts. The Professor knows how to stir things up, doesn’t he ;-) ?! And guess what? He is in the extremely iconic location of the Lofoten Islands at the moment, so may have trouble finding time to respond from there. I am glad that his thoughts have elicited your response though. This issue has caused me concern for some time too. // Every generation must discover the landscape and their response to it in their own way and in their own time. Throughout the admittedly relatively short history of landscape art (in Europe, circa 400 years), artists have visited mountains, cliffs, coasts, moors, lakes, glaciers, volcanoes, ancient ruins and places of legend, and found their own way of responding to those scenes. There have also been landscape artists responding to the quiet, the intimate, the abstract and the domestic scale of scene too. The former are instantly recognisable in the era of Google images and Google earth, whereas the latter are, by definition, not. // This is an era too of mass participation in art, especially the art of photography. The therapeutic and educational benefit of that is huge. It is not a competitive sport, but rather something personally challenging and fulfilling for the creator/illustrator/painter/photographer. The biggest ‘problem’, if problem it is, is finding the best way to participate in the wider community, for inspiration, ideas and feedback, while staying true to oneself. For what it is worth, anyone and everyone is entitled to encounter an iconic view, if you believe in freedom. Knowing something of the history of photography (if photography is your bag) then helps to put that encounter in context. In my case that usually means, “Ah yes, Colin got here first (Colin Prior)”. The advantage of knowing that is that I can then strive for something different, a challenge I enjoy. Kevin Allan: If a photographer enjoys getting to Bamburgh for dawn in the hope of good light, then I don’t agree that the activity is pointless, as Robin suggested. For a hobby, no other justification is required. Also, all those tourists visiting Bamburgh just happen to be the major source of employment in that area. On the other hand I do feel that those photographers who ask in Internet forums questions like “I am going to the Scotish Highlands / the Lake District / Yorkshire Dales for a week – where should I go to get good photos” are worrying too much. Just go anywhere in these great areas, go for a walk, and you will find something to photograph. Julian Barkway: Just after Christmas last year I was at Kimmeridge Bay in Dorset – a location I try to get to every winter and an icon if ever there was one! At low tide, it’s possible to hike and scramble your way around most of the bay where you can find all manner of interesting rock formations. However, on any given day you will usually see a cluster of photographers at the end of a long tongue of rock, not entirely coincidentally just below the car-park, attempting to capture the same long exposure of the flat rock disappearing into a misty ocean. On this visit, I had hiked around the bay and was returning to the car-park when I spotted three photographers lined up on the aforementioned ‘tongue’ all pointing their cameras in identical directions. As I neared them with my tripod in hand, one of them called out, “Come to join the party?” “Nah,” I said. “It’s been done to death”. “Yes I know,” came the reply. “But I haven’t managed to get it right yet.” We talked a bit about the evident lack of a good sunset, I wished them good shooting and then pottered back to the car. I guess that’s the point for some. They have an idea of how an iconic shot should look and just keep bashing away at it until they achieve pictorial nirvana. Whatever floats your boat, I guess. My view is that, as a learning exercise, this probably helps train technique but once a certain level of mastery is attained then all you are doing is chasing somebody else’s idea of how a scene should look rather than being truly creative and exploring the area looking for something a bit different (and that’s not hard to find at Kimmeridge since few photographers ever seem to stray very far from the car-park) Anyway, my rather meandering point is much the same as David Ward’s. It’s not the fact that you are shooting a well-worn scene that’s a problem per se. These places are popular for a reason, after all! It’s that if you don’t bring something of yourself to the image by looking for a new angle or novel composition, for example, it simply becomes a sterile exercise in copying the work of others. Catriona Thompson: Thank you for this, and for the pictures you shared. This is an interesting debate to start, and I think sums up some of my personal feelings about this magazine, and the masters that publish in it. I read onLandscape to improve my photography and to learn; I like to try and look for what is original, and yet there are many of the big vistas that I would like to try. Maybe to see if I can find something new in it, maybe to measure myself against what is already out there. So then I ask myself ‘what level am I?’. Can I ever be as good as those who publish while I sometimes wish to stand close to the tripod holes of so many others? I count myself as a learner, but still very much feel an outsider because of this. I wonder what it takes to join this community. David Tolcher: One factor with the whole tripod rage debate is that there is genuinely in some beautiful locations only one very small area that you can take a picture from where the various topographical features balance. Previous masters have found that spot – the view of the Buch from the river next to the A82 is a good example or the Saltwick Nab wreck has just a few square feet, if that ! where a tripod can be placed and the image ‘works’. As much as anything this drives the clustering of photographers I think. You can learn a lot if you take the location variables out of your picture taking and so I think its valid to visit the ‘honeypots’. Apart from anything else they are beautiful places that can just be enjoyed and particularly at the dawn/dusk times. Rachel Slater: I think photography is much like cooking. We have recipe books. . We like the sound of something or the look of something and we replicate it for ourselves. It isn’t a lack of creativity on our part to follow a recipe. . It means we liked it and wanted to enjoy it when it was made by ourselves. When we get more proficient at making those recipes we can start putting our own twists into the mix. I do all the cliché locations with relish because you never know when they will change! The Rannoch moor treestump I missed out on because I didn’t want to do a cliché shot but then the wind blew it down. As with the tree on lochan na h-achlaise or even Bedruthan steps which have now crumbled a lot. Each shot is unique because you have taken it yourself at that moment. My photography is for my enjoyment at that moment and if twenty other photographers are enjoying the same at that point then that’s a great shared joy.